The Chicken Recipes Kitchen (The home of delicious chicken recipes) invites you to try Lime chicken soup recipe. 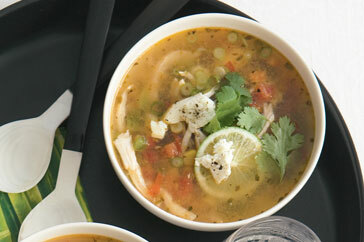 Enjoy our collection of quick & easy recipes and learn how to make Lime chicken soup. Chicken soup is the ideal winter warmer. Place water and chicken in a saucepan over high heat. Bring to the boil. Reduce heat to low and simmer for 10 minutes or until chicken is tender. Remove from heat. Drain chicken, reserving cooking liquid. Coarsely shred the chicken and set aside. Use a sharp knife to cut kernels from the corn cob. Heat oil in a saucepan over medium heat. Add corn and capsicum and cook, stirring, for 2 minutes or until capsicum is tender. Add tomato, cumin and oregano. Cook, stirring, for 2 minutes or until tomato softens. Add chicken, stock, lime slices and juice; bring to a simmer. Taste and season with salt and pepper. Ladle the soup among serving bowls. Sprinkle with coriander, green onions and feta. Serve immediately.